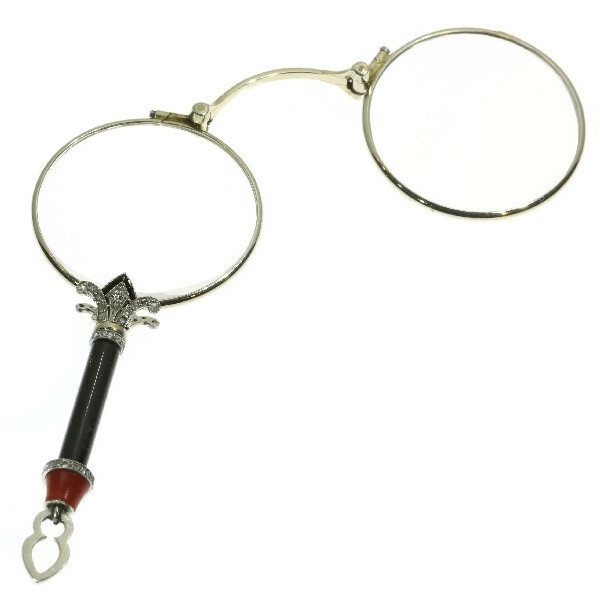 Typical Art Deco lorgnette or face a main with diamonds onyx coral: Description by Adin Antique Jewelry. Extra information: Art Deco - The Art Deco style is a very famous and popular art movement that had a lot influence in the world of jewelry. Art Deco was introduced in the 1920s as protest against the Art Nouveau style. Art Deco ended in the 1930s. The style emphasized a very abstract design with geometric patterns and as most favorite colors: black (onyx), blue (sapphire) , green (emerald) , white (diamond) and red (coral). The baguette and emerald-cuts, which had been developed in the nineteenth century, where very popular in the 1920s because they blended so much with the geometrical lines of the Art Deco style. Diamond(s): 53 rose cut diamonds. We do not have the weight of the diamonds which is normal in our trade when it comes to rose cuts. Two old cut single brilliant cut diamonds (also called 8/8) with an estimated weight of ± 0.06ct. (colour and clarity: G/I, si/i). Precious stones: Eight baguette cut onyx and an onyx tube.